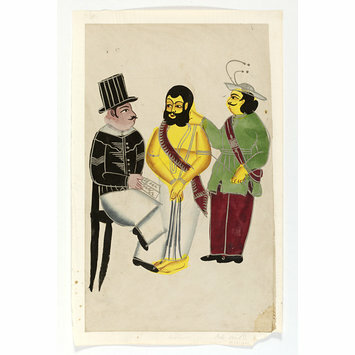 Painting, in watercolour and tin alloy on paper, an episode of the Tarakeshwar affair, the Mahant arriving in jail after his conviction, dressed only in a pleated dhoti and a shawl, he is roped to a jailer while standing before a fair-skinned jail superintendent. The Official sits in a black chair holding the Mahant's 'warrant of commitment' or conviction charges. His hairstyle, black coat with cut-away sides, white trousers and black shoes suggest the superintendent has a British or Anglo-Indian origin. The Tarakeshwar murder case of 1873 was a public scandal in Calcutta based on an affair between Elokeshi the young attractive wife of Nabinchandra Banerji and the mahant or chief priest of the Shiva temple at Tarakeshwar. Upon discovery of the affair, on 27 May 1873 her jealous husband Nabinchandra Banerji cut Elokeshi's throat with a fish knife. In the trial that followed Nabin was sentenced to life imprisonment and the Mahant was fined and imprisoned for 3 years. Different variations of this affair favouring the various characters occur in several Bengali plays and Kalighat images between 1875-80. See Archer p12. Purchased from Mrs K. Gregory. Historical significance: Calcutta was recognised as the Capital of British India from 1833-1912. By the 1830s, artists had arrived from rural villages in Bengal and began to produce paintings that reflected local history, mythology, customs and conflicts of a colonised society. As a popular art form, these artists are recognised for their use of brilliant colour, simplified images and swift brushstrokes that became the hallmark of Kalighat painting in the 19th and early 20th century. 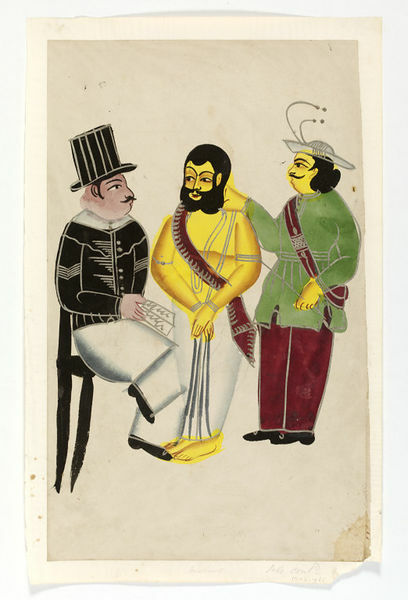 Jain, J (1999) 'Kalighat Painting: Images from a Changing World', Ahmedabad, Mapin, p155, fig 143. Knizkova, Hana, The Drawings of the Kalighat Style Secular Themes, Published by the National Museum Prague 1975.
pl. 39, cat. no. 17, xii: p. 61.